We are a family-run micro-dairy goat farm in Vermont’s Northeast Kingdom seasonally milking about a dozen registered Alpine goats. Our goats browse on our overgrown fields and forests and munch on hay from our fields which they fertilize! We believe that a delicious cheese will be produced with quality milk from animals that are raised in a healthy and happy environment. Our milk travels a mere fifty feet from udder to cheese vat and is collected, processed, packaged and aged by our family’s own loving hands entirely on our farm. 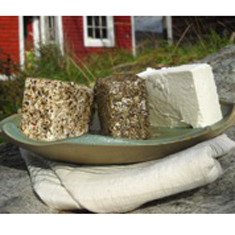 Crooked Mile Cheese can be found at the Lyndonville, Peacham , Littleton and sometimes Craftsbury farmer’s markets as well as retail outlets located primarily in or near the Northeast Kingdom. We can sell from the farm if you are in the area – give us a call! We make our cheese with care from start to finish and we hope you enjoy our efforts! Aged chèvre marinated in oil. 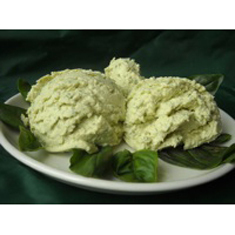 Basil & Garlic, Chive & Spring Onion, Cracked Peppercorn, Maple – Fresh, clean, smooth cheese flavored with a variety of fresh herbs and spices. Flavors available according to herbs in season! 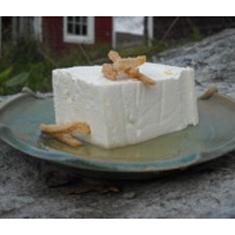 Smooth firm blocks of fresh chèvre with sweet and tangy ginger syrup. Plain, Herbs de Provence, Cracked Peppercorn – Firm blocks of fresh chèvre with a clean, smooth flavor. 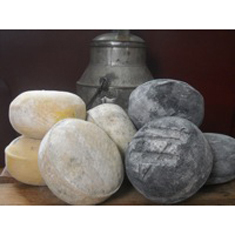 Young, pasteurized goat milk gouda is moist and rich with a natural rind.